The lowest PTD is set to be 0.1% and is then repeatedly doubled to create a range up to 51.2%. The risk is then assessed using Risk Integrated's Specialized Finance System (SFS), which runs a Monte Carlo simulation of a detailed CRE cashflow model to capture all property and loan details2. Chart 1 shows the profile of the annual probability of default (PD) of the loan until the loan's maturity. For this graph, the PTD is set to be 1.6% in the first year3. In year 1 the PD of the deal is 0.44%, i.e., much lower than the tenant's PD of 1.6%. This is because it is often possible to replace a defaulted tenant with a new tenant and because the tenant may have defaulted part-way through the year, after paying enough to service the debt4. The PD rises steadily over time, reflecting the underlying increase in the PD of the tenant. 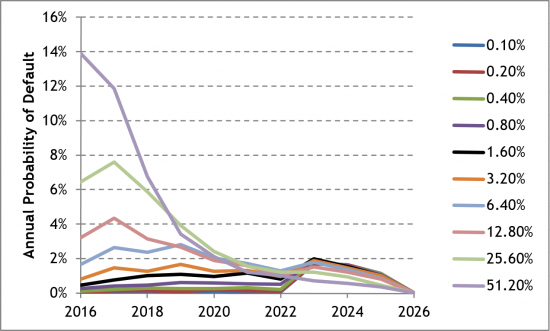 There is a spike in risk in the year 2023 when the current lease ends. 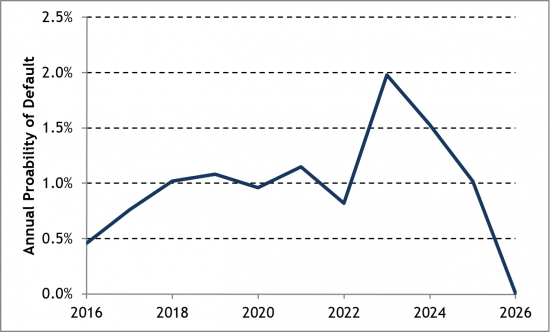 This risk continues, at a lesser level into the next year as the probability of getting a replacement tenant improves. In the last year, 2025 there is a 1% probability of default, mainly due to refinancing risk. By 2026 the loan has matured and the PD goes to zero5. 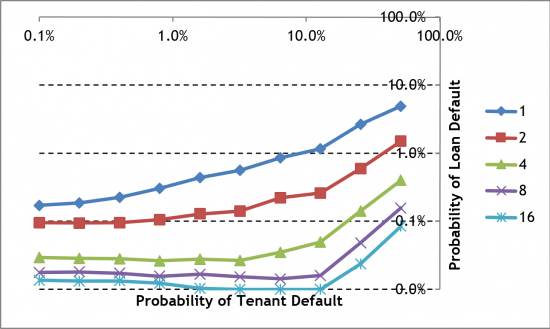 Chart 2 shows the risk profiles for the same deal, but with different levels for the probability of the tenant's default. The deals with higher PTD tend to have higher default rates in the early years and lower in the later years. The lower PD in the later years is because the deal has already defaulted before reaching those later years6. 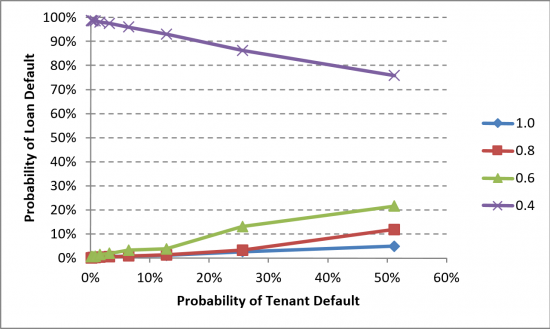 Chart 3 above shows that for low-risk tenants, increasing the PTD initially makes little difference to the PD of the deal because the tenant-risk is minimal compared with the lease-expiration-risk and refinancing-risk. However, as the PTD gets worse, the risk rises almost linearly, with the deal's PD increasing by approximately 0.1 times the increase in the PTD. Note that this factor of 0.1 is specific to this deal. 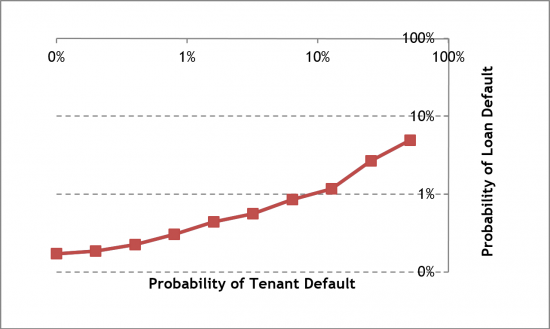 In the next section we will see that when we increase the LTV from 70% to 80%, tenant defaults become more important and the factor goes from 0.1 to 0.5. This trend continues and at 90% LTV the factor is around 1, and at 100% LTV the factor is around 1.2, i.e., a 1% increase in PTD creates a 1.2% increase in PD. Chart 4a shows the effect that changing the LTV8 has on the deal's sensitivity to PTD. Graph 4b shows the same information but with logged axes. 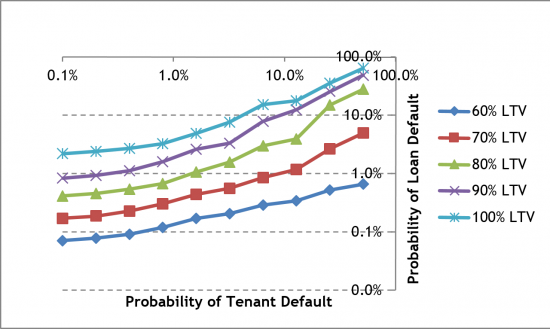 As one would expect, the higher LTV versions of the deal have higher probabilities of default, but we can also see that tenant credit-worthiness has a much greater effect on the high LTV deals. From this we can conclude that, generally, morerisky deals are more sensitive to tenant credit quality. Chart 5 shows the effect of tenant diversification. For this set of results, we return to the 70% LTV deal, but split the income amongst, 2, 4, 8 and then 16 uncorrelated, equally sized tenants. This creates diversification both for tenant defaults and for re-letting after the lease expiration9. To maximize the similarity for comparison, all the leases still expire on the same date as the single tenant. Now when a unit becomes vacant due to a default we only lose a portion of the gross income. Now when the leases mature, some tenants renew and some are replaced, so overall there is a greater chance of reaching the debt service required. Chart 5 shows us that diversification has a significant effect on the deal's baseline risk, but interestingly, it also shows that for the highly diversified properties, tenant risk becomes almost unimportant to this deal. 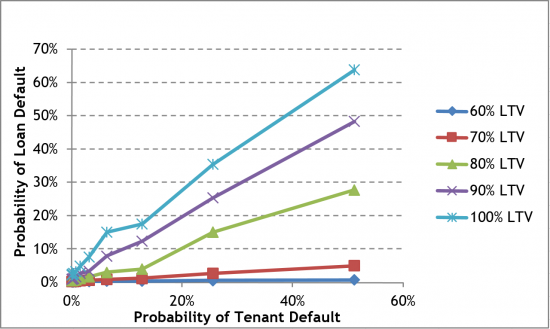 For example it is only at around a PTD of 5.0% that the riskiness of the 4-tenant deal starts to increase. So for this particular deal, tenant credit-worthiness does not really matter so long as there are 4 or more tenants and so long as none of the tenants have a PTD greater than 10%. Again, this result only applies to this particular deal configuration. The conclusions would be different if, for example, the LTV was higher, if one tenant was significantly larger than the others, or if the market rents were significantly lower than the current lease rents. Chart 6 shows what happens in cases where the current lease is below the prevailing market rate10. This test was carried out by decreasing the current lease by factors of 0.8, 0.6 and 0.4. 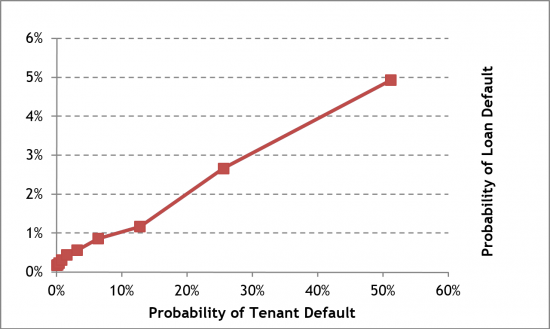 Even with leases down by a factor of 0.6, higher tenant PD causes higher risk because the potential void period after default still outweighs the higher market rent from a potential new tenant. In the more extreme case, with a tenant paying only 0.4 of the prevailing market, the deal is generally not able to service its debt with the current rent. In this case the debt can only be serviced if the tenant defaults, allowing the lease income to increase back to the market level11. For this case with rent at 0.4 of the market, we see that as PTD increases the PD of the deal decreases. Broadly speaking, if a lease was signed at a rate far below the now-prevailing market, it can be good for the current tenant to default so that it can be replaced with a higher paying tenant. This effect will be subtly different where there are multiple tenants, allowing the other tenants to pay the debt during the void period. The effect will also be different for long leases for which the long term of increased rent greatly compensates for the temporary void period. This paper demonstrates that in most circumstances tenant credit-worthiness makes a key difference to the credit-worthiness of the deal as a whole. It also illustrates the complexity of gauging the degree to which the tenant(s) will affect any given deal structure. In these examples, tenant credit-worthiness made little difference for low-LTV, diversified, under-rented deals and made a great difference to single-tenant, high-LTV deals. There are an infinite number of other possible deal structures, each of which will tend to either over-shadow or emphasize the importance of the tenant quality. It is difficult to generalize because the interaction between the tenant and the deal structure is complex and difficult to evaluate. However, knowing the impact of the tenants can make the difference between a good deal and a bad deal. The PTD does not stay fixed at 1.6%. After the first year it increases over time according to the usual corporate credit migration curves, and it also varies with the state of the economy. In the SFS, after a tenant defaults, there is a minimum void period after which there is an attempt to re-let the unit at the then-prevailing rental rate. The unit is more likely to remain empty for longer if the market is in a period of high vacancies. The PD refers to the probability of a first default. It may be possible that the loan defaults in 2025 and is still in default in 2026, but, as per Basel convention, only the initial default is counted and hence this case would only count towards the PD in 2025. As an example, in the ultimate case, if there was 100% probability of default in the first year, there would be zero PD in the subsequent years. The LTV was varied by increasing the loan amount. The amortization is still a 25 year traditional mortgage, so the debt service coverage ratio (DSCR) is decreased as the LTV is increased. 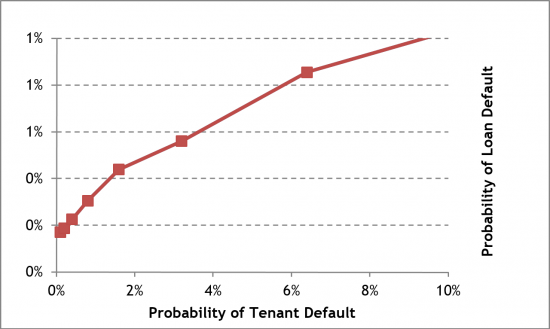 The lease expiration benefit can be seen in the reduction in the deal's risk when the probability of tenant default is negligible, e.g., at 0.1%. This typically happens when a lease has been signed in the past and there has since been a rise in the rental market. This assumes that if the tenant generally goes out of business, it will also lose the lease. However, if the tenant has the right to sublet, then when the lease is below the prevailing market, it is an asset and general bankruptcy by the tenant may not mean default on the lease. This causes an asymmetric effect whereby if the lease is higher than the market, a tenant default means loss of income, but if the lease is below market, there will be no default even if the tenant is bankrupt.